Will your group include both men and women? Children? Teenagers? Will it be only patients or will their friends and family be included, too? Will it be aimed at Christians only or would “seekers” be welcome, too? Will it just be for people in your church or are other people in the community welcome? Will it include all kinds of cancer or only one specific type? Will it meet during the day (often appeals to older folks who don’t want to go out at night) or during the evening (often appeals to younger folks who are still working)? I wanted to make it clear that there was a spiritual element to the group so people wouldn’t be surprised or upset if we talked about God or prayer, but I wanted seekers not to be put-off that they would be preached at or expected to know the Bible to come to the group. This has worked very well and everyone who comes to the group at least has a nominal belief in God. Over the years I’ve had people from just about every Protestant denomination, as well as Catholics, Jews and Christian Scientists. This makes for interesting discussion at times and a challenge to facilitate, but this is the way I’ve purposefully structured the group because I see it especially as an evangelistic outreach. Will it be a home, church building, office or other facility? There are advantages and disadvantages to each. Homes are cozy, but can be difficult to find and parking can be a problem. Church buildings are usually free and convenient but some seekers could be put off. Having my evening support group in our church building was very good because it has brought some people to a church building who hadn’t been in one for years (even decades!) and it was an important first step and reconciling past hurts with churches. Many patients have gone on to attend services with our church family. Medical offices are convenient and if it’s at the cancer center or oncology office where patients are treated, it obviously makes it easy to find! Some patients don’t like to come back to where they were treated, but most don’t seem to mind. 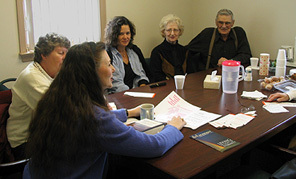 My daytime group met at our office in a conference room (We even had patients come to meetings hooked up to their IV poles if they are being treated during a meeting.) and it worked for years until we outgrew the room and moved to a nearby medical center. Determine how to publicize your group. Contact your local Chamber of Commerce to see if they sell mailing labels for churches or other groups you might want to contact. They also might be able to help you with listings of physicians etc. When I started my group, I initially sent out a letter to area pastors introducing myself and my new group (using my oncologist as a reference if they wanted to call him and ask about me). I included a flier and asked them to post it at their church and to put a note in the bulletin. It’s best to list the group meeting time by the day rather than the date (i.e. first Tuesday or second Monday etc.) so the flier doesn’t go out of date. My oncologist also wrote a letter (actually I wrote it for him and he signed it) telling all the local doctors about my new support group. We put it and a meeting flier in the doctors’ mailboxes at the hospital and that was a wonderful way to get the word out. Most cancer support groups do not last very long and I think the biggest reason is burnout by the facilitator. It takes a lot of time and energy to organize and run a support group so it makes sense to divide responsibilities. I am very fortunate that from the timeI began working with Dr. Hirsh in 1996, he allowed me to do some of my support group responsibilities at work because they fit with my job. I don’t think I could have ever continued as a lone facilitator for almost 24 years without this arrangement. I would recommend two or three people as facilitators and then divide up responsibilities according to your gifts and interests. You’ll have each other to pray for one another before and during the meetings. Take advantage of free publicity. Most radio stations, newspapers and local cable television stations give free print or air space to non-profit and community groups. Contact them. Ask about Public Service Announcements (PSAs), Community Bulletin Boards or support group listings. Also try to get a local newspaper reporter to write a story about your group starting. Most community papers are looking for news and will give you a little write-up and maybe a picture. Contact the paper’s news or feature editor.